When my husband and I were first married and moved to the area where we now live, I worked as a substitute teacher. Certified teaching positions were hard to come by at the time, and I had been humbled by rejection letter after rejection letter, polite "no thank yous," and a few devastating "sorry, we have filled the position" you can only dream of having right now responses. It turns out, willing certified substitutes are a hot commodity, then and now. 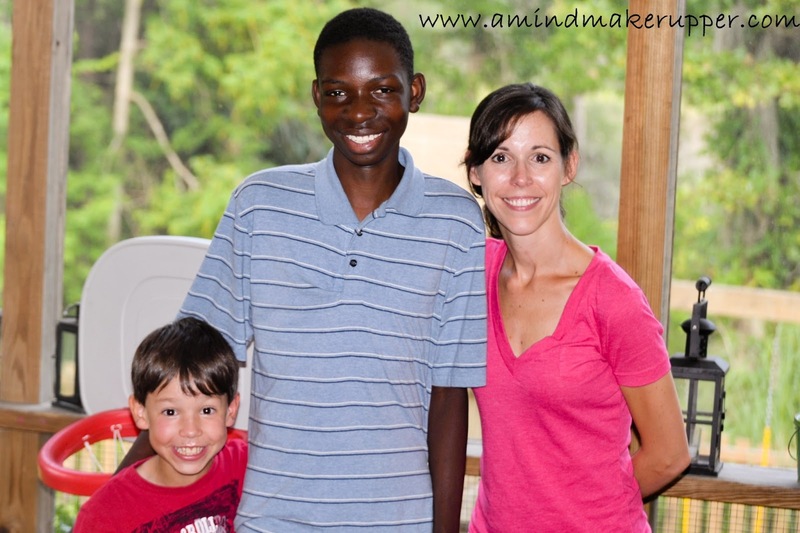 Substituting helped me make some money and get to know the local schools and their faculties. I desperately needed a job, even if I had to go about it the hard way. My first day on the job, I got a call to substitute in my dream school for a special needs teacher working within a larger, mainstream classroom. Really, I was a shadow of sorts for a kindergartner (let's just call him Ben) who had special needs. My job was to help Ben acclimate himself in his new classroom and participate both socially and academically with his peers. I am not going to lie. I was scared that first day. I felt totally unprepared for the job, but how could I say no? This was a school that had turned me down, and I was determined to show them that not hiring me was a mistake! myself working with Ryheim as much as I worked with Ben. You see, Ryheim was special too, but it would take years before I realized just how special. Fast forward a year. As it turned out, I ended up getting hired as a first grade teacher in the school where I took my first substitute teaching position. Remember that dream teaching job? I finally got it! And guess who ended up in my class the following year? Ryheim. You know, the dark, skinny, extremely shy boy with the huge, contagious smile. It just so happened that he had to repeat first grade, another divine appointment. I didn't know why, but I knew there was a purpose for our paths to cross again. I could just feel it. There was just something about that smile of his. It didn't take me long to figure out that Ryheim's beautiful smile was a window to his heart and a magnet to mine. God connected us that way. I knew that but getting this boy to talk was like peeling back layers of an onion. The more I discovered about Ryheim, the more I loved him, the more my soul ached for him, and I was inspired to help this boy, even beyond his first grade year in my class. It's hard to put into words the feeling I got from knowing that God was the one doing the connecting, but please trust me, it was there. It's still there. It is strong, and God makes his presence known in real ways. made up for with his pure heart and soul. Like I said, I couldn't help but love that boy. You might be wondering how I knew God was at work when it came to Ryheim. For starters, I just knew that boy needed my prayers. What are the odds in a school with 17 first grade classes that he would end up in my class? When I found out Ryheim's heat source was broken, my husband just happened to be working with a commercial electrician. It was around Christmas time. You should know, Ryheim's mobile home was very obviously falling apart from the outside. Every time I drove by it, I prayed God would help me get that child a new one. We knew it was a shot in the dark to ask a very busy electrician to go and check things out at Ryheim's house, but we asked anyway, and he said yes without hesitation. Not only did he fix the heat, he ended up fixing an electrical problem that was a time bomb for sending the mobile home up in flames. And guess what? That sweet electrician also saw the leaky roof and sent some roofing guys out to help fix that too, all free of charge. Ryheim wanted to succeed, to be kind to others, to have friends, to make good choices, and to make those who love him proud. School was really hard for him, though, and learning was even harder. Both of those things, so necessary for success, are still a challenge, but that has never stopped him from trying. Ryheim worked hard in my class. He did well, despite some sweat and tears from both of us, and he went on to second grade. same bus that came through my neighborhood. Instead of tutoring Ryheim at school, he got dropped off at my front door. Another divine intervention, I am sure. By the time the bus routes changed again, my kids were in school too, so picking him up is no problem. We try to do that once a week. Somehow it just works. Ryheim is 15 now. I am still Ryheim's teacher today, and he is still mine, and so much more. We have become family. It took 10 years of praying and lots of failed attempts on my part, but just this year, a local church delivered a beautiful mobile home to Ryheim's old front door. It is a lesson to me that sometimes we have to let go in prayer and get out of the way so others can do for God what we can't accomplish on our own. There have been times over the years when I have shed many tears and prayed lots of prayers wondering if Ryheim was going to make it through school, but he always does. That brings me to the reason for this blog post. Just a few weeks ago, I had the absolute honor of attending Ryheim's eighth grade graduation. It was another moment in my journey with Ryheim that I could just feel God at work. His sister invited me and told me Ryheim was receiving an award. I would not have missed that event for the world! There was only one problem. With 450 kids graduating, each family was only allotted 2 tickets. It was held in the main sanctuary (another purposeful happening) of a large local church. Those without a ticket had to sit in an overflow room and watch graduation unfold on a big screen TV. I really did not want to be in that overflow room, but I knew tickets were few and far between, as you might imagine. I was so thankful when a wonderful friend of mine graciously offered me her two extra tickets. She had won two front row seats at an auction. My problem was solved, and I even had an extra ticket to pass on to Ryheim's family. When I got into the sanctuary graduation night, seats were going fast. Apparently there were too many tickets and not enough seats. I found one particular seat that stood out to me, and I took it. I was sitting on a one-seat row all by myself at the very back of the room near the exit. As I sat down, it occurred to me that not only was I getting to see Ryheim graduate, but I was also going to get to watch most of my former first graders graduate from his class. That is a gift for any teacher! My story gets even better. Where I chose to sit, that was another divine appointment. All 450 graduates walked right by me as they marched in to the sounds of "Pomp and Circumstance." Ryheim didn't know I was coming. As he passed me, so handsome in a suit and tie, I got to grab his hand and catch his eyes. It was an amazing moment. But that's not all. Out of 450 students, Ryheim received the "Most Improved Student" award that night. I could not have been prouder or happier. And you know what, that is how God works, friends, when we invite Him along on our journey. Ryheim is a blessing in my life for so many reasons. He is what faith in our saving God is all about. I admire Ryheim's raw determination. He doesn't succeed at everything he does, and he struggles much of the time, but he keeps going because he knows God is calling him for more in his life. Ryheim taught me that as human beings and adults, we can't give up on kids who want to succeed but don't know how. We just have to push ourselves to be patient and get more creative in our efforts. And above all, we have to pray through the work we are called to do. Thank You for Your amazing and awesome divine appointments. Thank You for filling me with Your love. Thank You for the blessings only You can bring to my life. Forgive me for the times I have not used Your blessings as gifts for blessing others. Help me, God, to be more aware of Your day to day presence. I pray You will give me the eyes to see and the ears to hear Your calls to love others for Your glory. The deadline for our "Pockets of Hope" fundraiser has been extended to June 30. Time is ticking, but we can still reach our $1000 goal with just a little faith and some creativity. Change drawers, collection bottles, lemonade stands, bake sales, and car washes are just a few ideas to spark your mind. We need your help! Let's keep circling God's promise and help the tornado victims in Oklahoma. No worries, this is a do-it-your-way fundraiser! 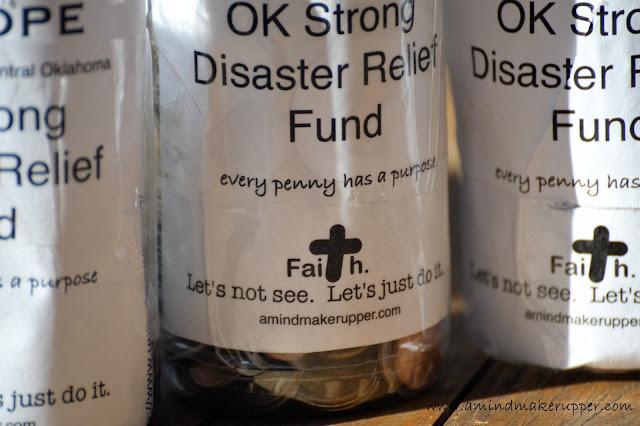 If you have raised money or made a personal donation to the OK Strong Disaster Relief Fund on your own, don't forget to email me at amindmakerupper@comcast.net so I can add your efforts to our total. Every little bit helps. Thank you, thank you, thank you to all who have already given so graciously. You are amazing. Thank you for the miracles you are working in our efforts to give generously to the OK Strong Disaster Relief Fund. Please, Lord, use our pennies for Your good and perfect purposes. May we glorify You and praise your Holy name today and always. 3 And he said: “Truly I tell you, unless you change and become like little children, you will never enter the kingdom of heaven. 4 Therefore, whoever takes the lowly position of this child is the greatest in the kingdom of heaven. 5 And whoever welcomes one such child in my name welcomes me. Last week was VBS at my church. 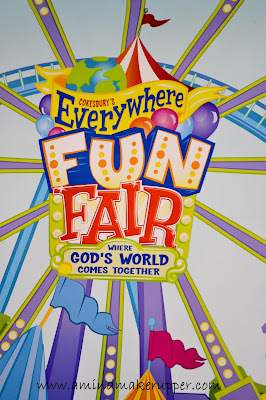 Yes, I am talking about a week of Vacation Bible School. It 's one of my very favorite happenings in the life of the church, but it occurred to me as I was running around like a very sweaty and headless chicken that VBS has nothing to do with a vacation if you volunteer and everything to do with a guaranteed Very Busy Schedule! One thing is for sure, after a week of VBS, I definitely need a vacation. The work is well worth it, though. Every year, it is an amazing experience to be a part of 260+ children learning about God and growing in their faith. It never fails, I always grow in my faith too. It can't be helped. You can see, feel, and know God as you go through it from beginning to end. The relationships that form and strengthen are priceless. It takes a huge body of volunteers to make VBS work, and this year, I got an email months ago asking me to be the VBS photographer. I said "yes", but I have to be honest. It was not without hesitation. Being the VBS photographer is a huge responsibility, and it was overwhelming to me. Yes, I do have a nice camera. Yes, I love to volunteer for VBS. BUT, I was thinking more like being a small group leader, a teacher, or a snack volunteer. Those things I knew I could handle. Photographer had not crossed my mind. I take pictures of my own children and still objects for my blog, not huge groups of multi-aged, energetic kids on a mission to move to the next exciting rotation. I felt completely inadequate for the job. What if the pictures weren't good enough? What if I couldn't pull off the group photos of all those wiggly kids with their very short attention spans? I was a teacher. I know how kids work. Hundreds of people would be looking at those photos. What if I didn't get everything and everyone? And most terrifying to me, I had absolutely no clue how to put together the all-important, grand finale slide show, with music. The VBS photographer has to capture the essence of the entire week in pictures. Didn't the VBS directors know that pictures speak louder than words, and I am clearly better with words? What the church really needed, I thought, was a professional photographer with more experience. BUT, the church specifically asked me, and I couldn't say "no" (even thought I really, really wanted to). Sure I could think of a million good excuses for saying "no", but my faith is why I said "yes." 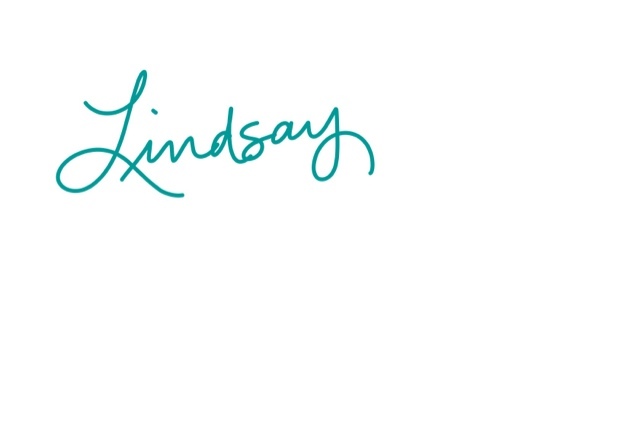 This everyday faith I am trying to grow and nurture means saying "yes" when God calls me to do something for Him, even when it would be so much more comfortable and easy to say "no." 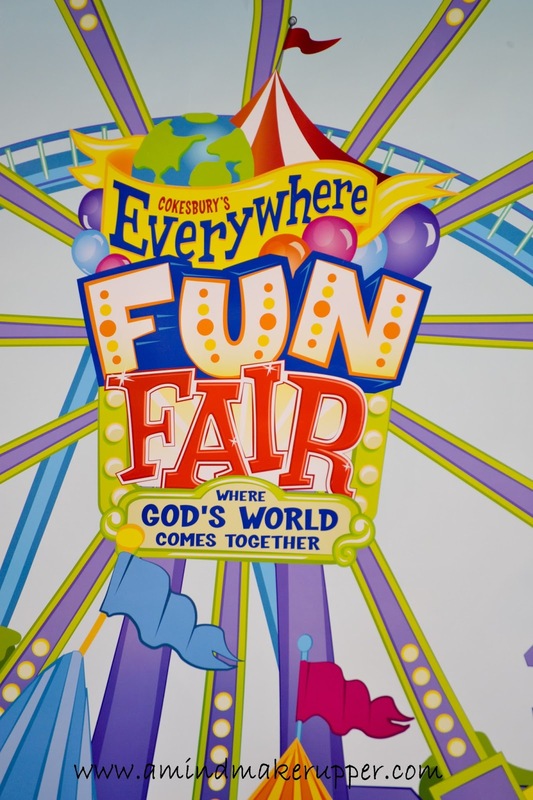 Sometimes, I admit, I miss the mark and say no because I don't realize God is the one who is doing the asking, but when my church asks me to do something very specific for our children and VBS, there's no doubt. That's God talking. That's why I had to say "yes", and I prayed through my anxiety, fear, exhaustion, and those haunting feelings of inadequacy. Sometimes, saying "yes" is a true test of our faith. 4 There are different kinds of gifts, but the same Spirit distributes them. 5 There are different kinds of service, but the same Lord. 6 There are different kinds of working, but in all of them and in everyone it is the same God at work...31 Now eagerly desire the greater gifts. And so, I took the pictures for VBS all week. I did it, and God blessed me along the way over and over again. At times, it was far from a bed of roses, and there were many retakes and imperfect shots, especially when it came to the group pictures. Group leaders were probably over me and my efforts at times, and I have some photos to prove the kids were definitely over me and my camera. And that nagging, terrifying, looming, and inevitable slide show, well, I prayed more about that than anything else. And after two late nights of tireless effort and attempts with little sleep, God took that burden right out of my hands. Our sweet, young, technology savvy middle school youth director offered to take the pictures and put them together in a slide show. When I hesitated to take her up on her offer, she insisted. I am sure she quickly realized it was easier to just do it herself than to answer all of my complicated, confusing questions. The slide show was done, with music, just like that. It was beautiful and the perfect ending to an amazing week with God. "God doesn't call the qualified. He qualifies the called (Mark Batterson, Draw the Circle: The 40 Day Prayer Challenge)." That's how God works, and that's what Paul is talking about in 1 Corinthians 12 when he encourages us to "eagerly desire the greater gifts." With God, we don't have to be the most educated, have the most experience, possess the longest list of credentials, or be the perfect prototype for the job. We just have to say "yes" in faith. God provides the rest. He blesses us so that we can bless others. God has something for everyone to do in His name. I am so thankful for my week of VBS and every single person that took part in it. My prayer for today for all who read this blog is adapted from 1 Peter 10-19. I encourage you to follow the link and read the scripture as it was originally written before you pray. How is God calling you? What is He asking you to do for Him? What gifts does He want you to use? In saying these words, I pray you will each get to experience the power and glory of God by recognizing His call and saying "yes" to Him. He will bless you each step of the way and then some! Thank you for blessing me with gifts. Guide me to use whatever gifts you have given me to serve others, as a faithful steward of Your grace in its various forms. When I speak, help me to do so as one who speaks Your word. When I serve, help me to do so with the strength You, God, provide, so that in all things You may be praised through Jesus Christ. To You be the glory and the power for ever and ever. For all the details on our "Pockets of Hope" Fundraiser please visit my post from May 28th. It's not too late to take part in our efforts to raise $1000 for the OK Strong Disaster Relief Fund in Oklahoma. The deadline for meeting our big $1000 goal is June 28th. 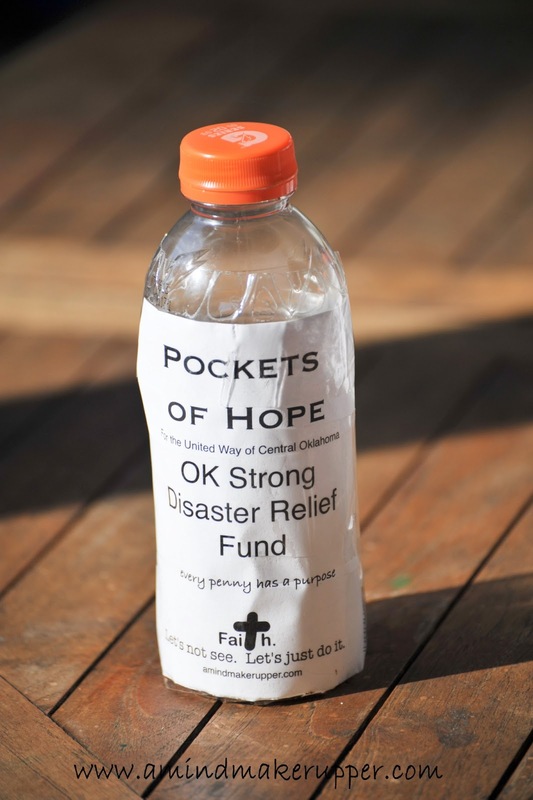 You can raise money in whatever way works best for you and turn all money into The United Way of Central Oklahoma at http://www.unitedwayokc.org/news-media/governors-disaster-relief-fund. As I have mentioned, our "Pockets of Hope" bottles have turned into a competition to see who can collect the most money in our house. 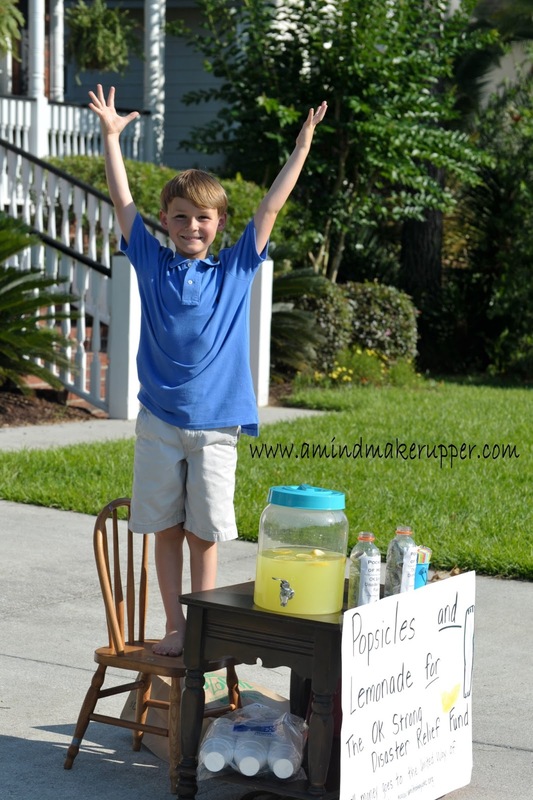 My middle son decided that this cause was a perfect excuse for a lemonade and popsicle stand. What kid doesn't love a lemonade stand? 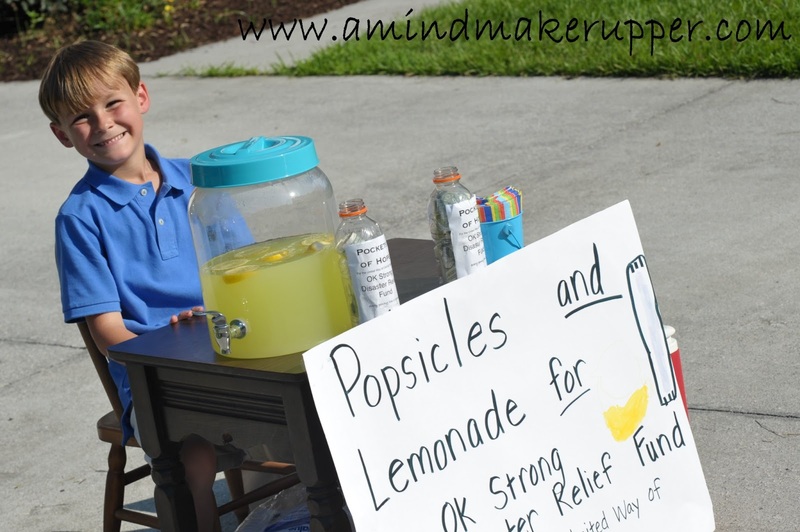 In about an hour, he raised $10.31 last Sunday, and he had a blast doing it! I'm a proud mom. I really hope you'll join us in our fundraising efforts! We can't do it alone. It would take an awful lot of lemonade and popsicles at our house. Inspire my heart through your Holy Spirit. Bless me with Your joy and peace so that I can bless others. I continue to pray especially for the comfort and healing of all those affected by the recent tornadoes in Oklahoma. 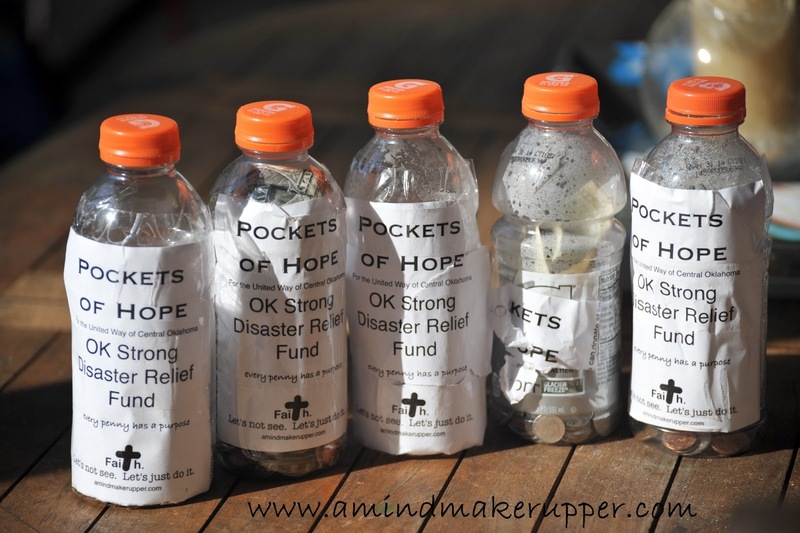 Be with us in our "Pockets of Hope" efforts to raise money for our neighbors in Oklahoma. Two weeks ago I watched the most heart wrenching baseball game I have ever seen. It was the first, and last, playoff game of the season for my nine year old son's rec team. It was a match up between a winning record and a losing record. Let me just clarify it for you a little further. My son's team went into that game as THE underdog team in the league, having only won one baseball game all season. Who am I kidding? The season was pretty rough. I didn't think it could get worse (and that's what I get for thinking). The team was at the very bottom of the standings. The numbers weren't good. To tell you the truth, I prayed for those boys and their team before the playoff game. They needed all the help they could get, and they really needed a boost to their spirits. Morale was low in the stands and so were our expectations for a win, although we would never let our kids know that. That being said, would you believe those boys played their hearts out that first night of the playoffs? Go figure. They played the best game they played all season. Their spirits were alive on and off the field, full of hope. Those kids had a spark in them that night that was beyond our understanding. Before we knew it, we were at the bottom of the last inning, and it was 4-3, in our favor. The other team was up to bat. They had a kid on first and a kid on second with 2 outs. Our kids could taste a huge, well-fought victory. The boy up to bat hit a grounder to second. Our second baseman caught it and threw it to third. By a miracle, our third baseman, got the ball, stepped on the bag, and tagged the kid just before his foot was able to slide into third. It was beautiful. The ump called the kid out, and our kids went crazy jumping for joy!! They had just won the ballgame by one run! As the parents in the bleachers behind the third baseline, we could not believe our eyes. We erupted in excitement For a split second, it was awesome! That was what it felt like to win, FINALLY. And then it happened, the beginning of the heart wrenching part to this story. Our celebration, all few seconds of it, was abruptly cut off by the loud screaming and ranting of the opposing coach who had come out of nowhere to third base to place himself in the faces of the ump and our poor little third baseman. He and his blood red face were jumping off the ground with anger, for the whole world to see, insisting that our third baseman had only stepped on the bag and had not tagged the kid out. With all due respect, the timing of our third baseman's tag was crucial, but we saw it with our own eyes, and the ump made the call. The boy from the other team was out, and our third baseman kept insisting, "But I did tag him. I did tag him." In the ump's defense, that other coach was a really scary and disturbing sight for innocent eyes. I am not sure anyone could have kept me in my seat had my son been the third baseman he was jumping all over. But, with no way to look at a replay, our stands and coaches insisting the boy was tagged out, and an ump shaking in his boots, the ump reversed his own call. The other coach had definitely turned his "ugly on", and it changed the course of the ballgame. Stunned, we sat ourselves back in the stands, coaches resumed positions, and our kids put their hats on and went back on the field. Bases were now loaded, and we still had 2 outs. We finished the last inning with a tie ballgame 4-4 and had to play extra innings until there was a winner. And the story continues to go further and further downhill from here on out (no pun intended). In this league, to rest the kids' arms, pitchers are only allowed to pitch 3 innings per ballgame. Extra innings meant we had already gone through two of our 3 pitchers, and the last pitcher HAD to finish out the ballgame without a backup. Well, guess who the lucky kid was? My son, of course, no pressure! I was a wreck, and I hoped my son couldn't see my face. We ended up playing a seventh and an eighth inning, holding at a 4-4 ballgame until the bottom of the eighth inning. I am was not exaggerating when I said that other coach had turned the "ugly on" with his little escapade that sent us into the extra innings, and he kept it going for the rest of the ballgame, completely dismantling and unnerving our team and the ump. Bless their hearts. My son, who happens to be one of the smallest kids on his team, was forced to pitch through the unrelenting taunts and degrading comments of the other team, a team whose sportsmanship, to no surprise, mirrored the demeanor and character of their coach. The kids and coaches on our team had done nothing to deserve the treatment they had to play through. Two more times we thought we had finished the eighth inning with another tie, sure my son had thrown strikes, but the ump called them balls. The calls just didn't go our way that night. The opposing team finally scored a run on us, and we lost the ballgame. Those kids, heads down, took off their hats, lined up, shook hands with the other team, and congratulated them on a good game. I have never been prouder of that team or my son. He is nine, and he played his heart out under extreme pressure, holding his own with grace and integrity way beyond his years. I have no idea how my son was able to pitch those innings without breaking out in tears for all to see. I have no idea how my husband and I were able to stay seated and refrain from ripping that other coach a new one (pardon the expression, it's the best I could do and still keep it clean). That's how bad the unsportsmanlike comments were, to say the least. 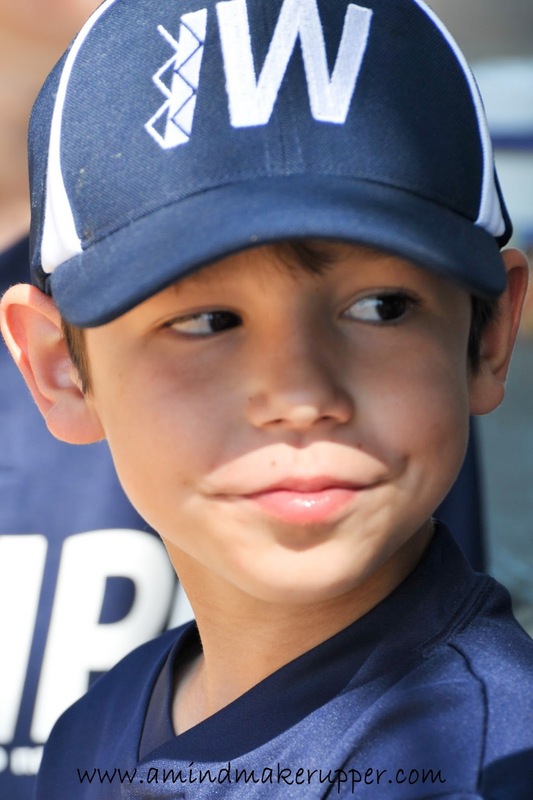 I ran to the dugout and met my son and his teammates, who by this time, all had eyes full of tears. 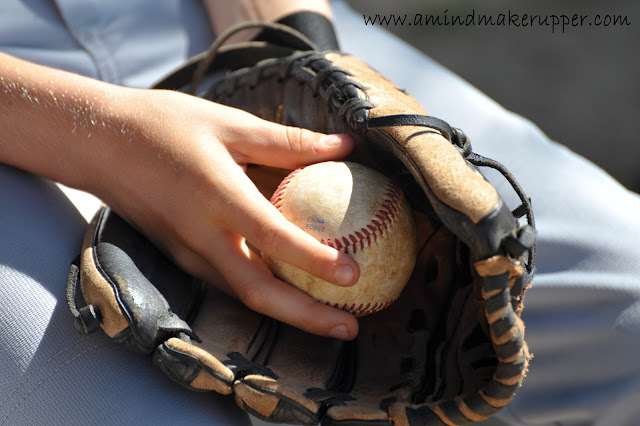 As parents, we started clapping and telling them what a good game they played, but that did little to comfort those boys. That ballgame was like the battle between David and Goliath, the giant and the underdog, except the good guys didn't get to win this time. My heart was broken for those boys, in true Mom fashion, and my husband's heart was too, but he was furious, in true Dad fashion. My son was just pleading and crying, "Mom, did you see my last two pitches? They were strikes. I know they were. We should have won. We should have won. Those calls were terrible and stupid!" Thank goodness for two cars that night. I sent my crazy, mad husband home with the happy, cute two year old, and I hurriedly ushered my two older two sons to the car with me. I knew we needed to get there and shut the world out. As soon as we were all in and the doors closed, I answered my son. "I know you should have won that game, buddy. You played your heart out. You played an awesome game," and the waterworks followed. I just cried with my son. I didn't know what else to do, and I knew this wasn't something I could fix. His heart was broken, and that broke mine. We did the only thing I knew to do. We gave each other "a little lovin'" as we like to say, got ourselves together, and then we went to get milkshakes. I let them order whatever size their little hearts desired. I couldn't help it, and both boys ordered extra-larges, of course. With milkshakes in hand bigger than their heads, their smiles bounced back on their faces, and we talked about the game the whole way home. The way that other team won the playoff game, that was not how my son really wanted to win. It truly isn't winning when you lose your dignity in the process. Their horrible loss wasn't about the ump or the opposing coach, really. The truth was, that ballgame was a reflection of a hard big-world reality, beyond our understanding. Good guys get the raw end of the deal sometimes. Bad things happen to good people. People make bad choices and mistakes that impact the most innocent and precious of human beings. All the faith, heart, and effort in the world cannot save us from mistakes, loss, disappointment and struggle. We don't always get the fairytale out on the baseball field or in our relationships, in our families, in our jobs, in our finances, in our homes, but when we invite God to be a part of our circumstances, there is always hope. No matter what happens to us, good or bad, we always have two basic choices. We can face what is in front of us with God or without Him. I am so proud of my son for letting God be with him on that baseball field. Through faith, we know God is making us stronger in character, especially when we struggle with life, and we let God win, regardless of our circumstances, our odds, or the numbers stacked against us. The real champions that night were my son and his teammates. They may have lost the game by our limited worldly standards, but they walked away from the field with hearts overflowing, full of God's love, grace, and peace. That's a win for our souls to celebrate, far bigger than any playoff game. Please forgive me when I do not let you win in ALL of my life circumstances. Strengthen my faith in you and give me the courage to face all that is before me with You. Lord, I pray you will pour your love into my heart through your Holy Spirit and let me know your peace that surpasses all understanding. Show me Your way.